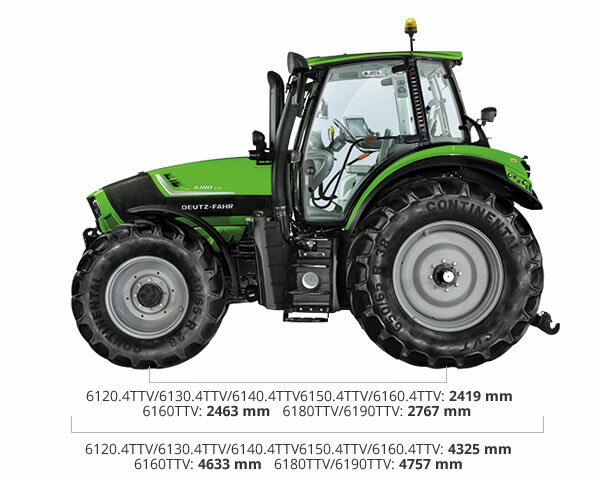 The 6 Series TTV brings together the most advanced technology developed by DEUTZ-FAHR in a tractor that combines outstanding performance with superior fuel economy and unrivalled driver comfort. The innovative Deutz engines with SCR technology are even more powerful, efficient and ecological than ever, and form the perfect match with tried and tested ZF continuously variable transmissions. Giugiaro Design penned the unmistakeable style of the 6 Series TTV, with futuristic forms for the mudguards, an elegant engine cowl and a cab offering unrivalled levels of equipment and trim. A powerful, clean and unbeatable engine. The engine of the 6 Series TTV boasts an plethora of high technology solutions which maximise performance and minimise specific consumption and emissions. Offered in four and six cylinder configurations (both with four valves per cylinder), these Deutz engines feature turbo-intercooler forced induction with a wastegate valve. With integral electronic system controlling the DCR (Deutz Common Rail) injection system and SCR (Selective Catalytic Reduction) exhaust after-treatment, the Agrotron TTV series is compliant with Tier 4i standards. By using the SCR catalytic converter, which reduces emissions effectively without exhaust gas recirculation, these engines consume up to 10% less fuel than previous versions without SCR with equivalent power outputs. The DCR injection system uses two injection pumps lubricated with engine and specially configured combustion chambers to deliver superlative, constant performance even during the toughest traction applications, while injection pressures of up to 1600 bar ensure outstanding responsiveness and a generous torque reserve even at low engine speeds. The electronic engine governor eliminates fuel wastage by delivering only the power effectively needed for the job in hand. From ploughing to road transport, and from general farm tasks to working with both front and rear implements, the innovative engines of the 6 Series deliver extraordinary performance with low environmental impact. Power is nothing without a transmission that's up to the job. The TTV transmission combines the efficiency of a conventional mechanical transmission with the comfort and smoothness of a hydrostatic system. The result is an efficient, reliable solution allowing continuous speed variation to put the power produced by the engine to the most effective use possible, and does so effortlessly and without wastage, making your job even easier and more productive. These tractors are equipped with TTV continuously variable power split transmissions, which split the power produced by the engine into two components: the majority of the power is transmitted mechanically via planetary reduction gear units and wet plate clutches, while the remaining component is transmitted hydraulically by a load sensing pump in a solution that allows the speed of the mechanical component to be varied as needed. By varying the delivery of the hydraulic pump, the speed of the tractor can be increased smoothly, without the sudden jerking during gear shifts typical of a conventional transmission. The mechanical and hydraulic power components are recombined at the output of the transmission by planetary combination gear. 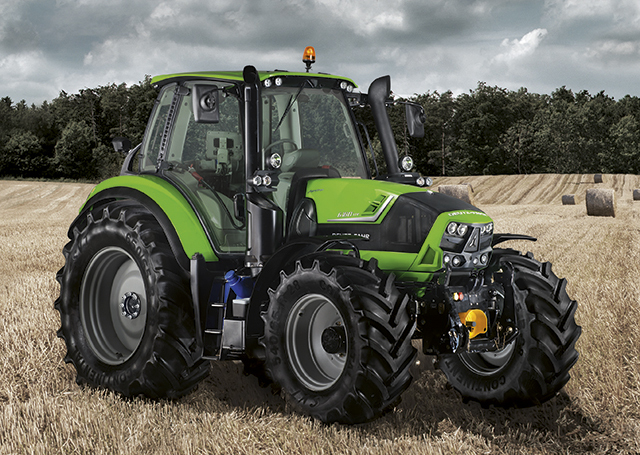 The 6 Series TTV offers the driver a choice of three different modes: Manual, PTO and Auto. In manual mode, engine and vehicle speed are controlled directly via the accelerator pedal and multifunction joystick. In this mode, TTV models drive like a tractor with a mechanical transmission, but with the smoothness typical of a CVT transmission, while also offering the driver an infinite choice of ratios. 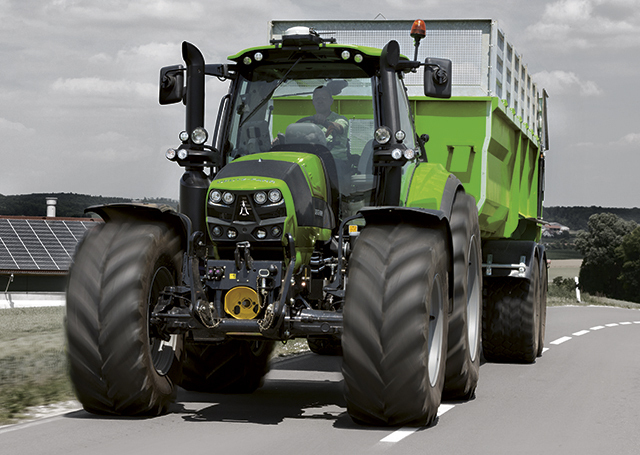 In PTO mode, the speed of the PTO is maintained at a constant value independently of the speed of the tractor (which the driver can continue to modify continuously). this functionality overcomes the major limitation of conventional mechanical transmissions, which cannot maintain uniform PTO torque at different engine speeds without changing gear. In automatic mode, an electronic control unit varies the transmission ratio and adjusts engine speed in relation to load to maintain a constant vehicle speed. Completing the transmission system is a dedicated electrohydraulic reverse shuttle while allows direction inversions even under load. 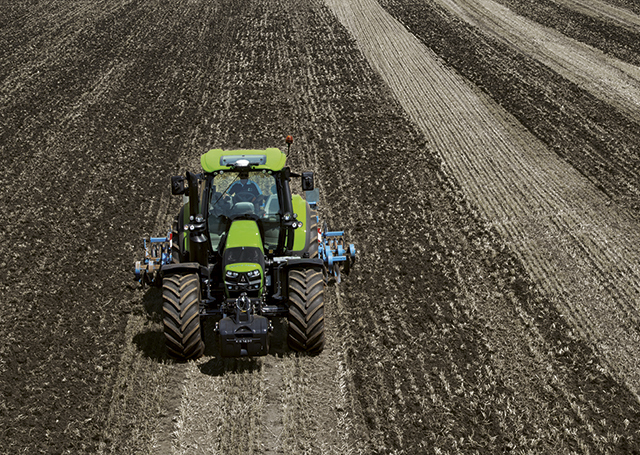 A PTO that sets new standards for versatility. 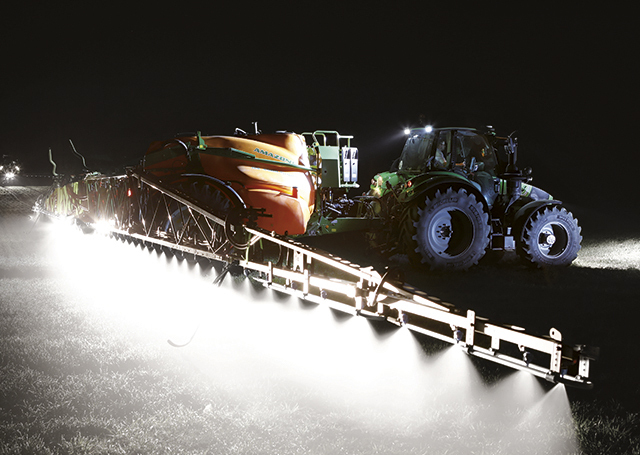 Superlative versatility is what sets the Agrotron 6 Series TTV apart. With four speed modes offered by the rear PTO (540/540ECO/1000/1000ECO) and an optional synchronised PTO, these tractors are truly compatible with any implement. 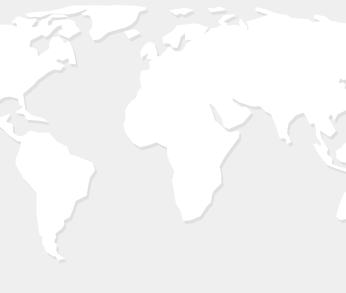 All modes are selected and engaged electrohydraulically with an automatic load sensing function to ensure that the implement connected is always started progressively and smoothly. The PTO is simple and rational to operate, with electrohydraulic controls and an LCD screen displaying the effective PTO speed, allowing the driver to use any implement in the ideal operating conditions. Remote PTO controls on the rear mudguards are included as standard, while a front lift with a 1000 rpm PTO (also available as ECO variant) is offered as an optional accessory. Highly automated, extremely efficient hydraulics. The base configuration consists of a 120 l/min load sensing pump (or optional 160 l/min variant) and four electronically controlled dual action distributors as standard (or up to seven as an option), while two additional dual action distributors may also be installed as an option at the front of the tractor. All the distributors may be locked if needed and switched between single and dual action mode, while the lift is in use in “float” mode. The electronic rear lift has a maximum load capacity of 6200 kg (which may be increased to up to 9200 kg with the addition of optional hydraulic rams) and is equipped with the EHR control system, which in addition to implementing draft force and position control in mixed or floating mode, can also interact with the optional radar system to enable slippage control functionality. Maximum slippage is settable from a specific potentiometer. Other functions integrated as standard in the EHR system are quick soil engagement, oscillation damping for mounted implements, position selectable lock, implement height and lift limiter and rate of drop control. The operating parameters of the rear lift are adjustable from controls on the lateral console and shown on the digital display of the instrument panel or on the iMonitor2 interface. An optional front lift is also available, with a maximum capacity of 4000 kg and a 1000 rpm (or, alternatively, 1000 ECO) PTO. You can never have too much safety. For maximum productivity and sure-footed, safe manoeuvrability when driving on the road, an electronic control unit engages or disengages dual traction and the differential locks in relation to speed and steering angle. The hydrostatic steering system is fed by a dedicated independent pump to ensure total control and smooth, effortless steering action in all conditions, even when other hydraulic utilities are operating simultaneously and with the engine at idle speed. With the engine running and the transmission in Auto or PTO mode, the Power Zero (active stop) function is also available. 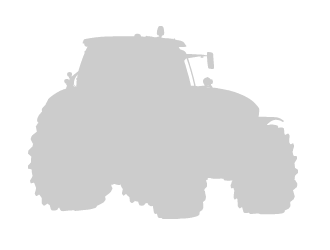 With this function enabled, the transmission holds the tractor stationary without the operator using the handbrake, irrespective of gradient and load, when the engine is at idle speed. You can never have too much braking safety, so the 6 Series is also equipped with the innovative Power Brake system, which minimises the pedal force needed for braking and maintains a constant pressure in the hydraulic brake circuit to ensure an instantaneous, powerful and perfectly controlled response. The system also includes an auxiliary emergency accumulator which allows up to ten stops even with the engine off. Last but not least, the electrically controlled EPB system (Electric Park Brake) ensures superlative safety even when stopping the vehicle on a gradient. User-friendly controls for unparalleled driving pleasure. The 6 Series TTV is equipped with the MaxiVision Cab, which offers extraordinary high technology solutions combined with superlative comfort. With electronically controlled automatic air conditioning system and seats with self-levelling air-sprung suspension (or optional active suspension), the cab offers the perfect environment for working in complete comfort. All the controls for the work lights and road lights are organised on a latest generation panel, while the ergonomics have been optimised with rationally laid-out controls and clearly, immediately legible information on all operating parameters. The levers and buttons are rationally grouped and organised according to frequency of use, while all the controls are colour-coded for immediate identification: each colour corresponds to a specific operation, allowing the driver to quickly and instinctively find and use the right button. 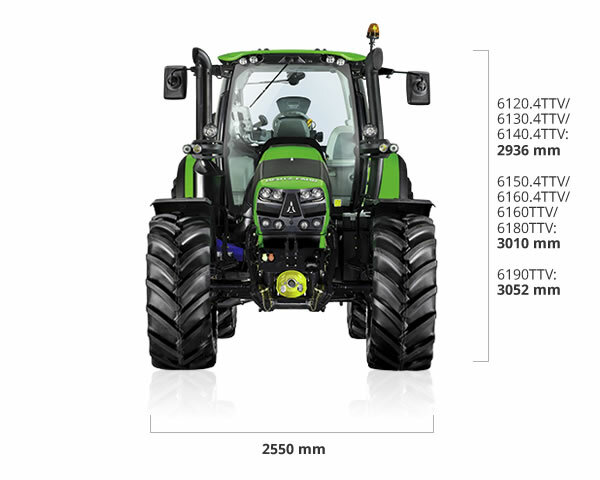 All the operating parameters of Agrotron TTV 6 Series tractors are monitored continuously by three different multimedia devices: the Work Monitor (mounted on the A-pillar), which displays the status of all machine functions; the Infocenter (in the instrument panel), which provides information on system and device states; and the iMonitor2, the innovative IsoBus-compatible multimedia interface, which manages the configuration of all operating parameters. Conceived to offer total control over the many different functions available, the iMonitor2 lets the driver interact with the machine at the simple touch of a screen, or from the control panel on the lateral console. A 12,8” screen is mounted on the lateral armrest, while the entire system is integrated with the driver seat. The Work Monitor puts the driver in control of any implement compatible with this new standard through a specific IsoBus connector. And for even greater productivity, the Work Monitor may be complemented by the Agrosky that, in its most advanced iteration, includes an automatic guidance function. With the frontloader consoles that are part of the TopLift package the 6130.4 CShift and 6140.4 CShift TopLift are already perfectly equipped to be used with a frontloader. 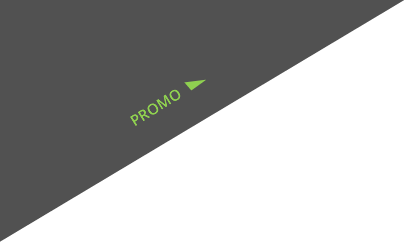 This offer applies only in Nordic area and only as long as stocks last. 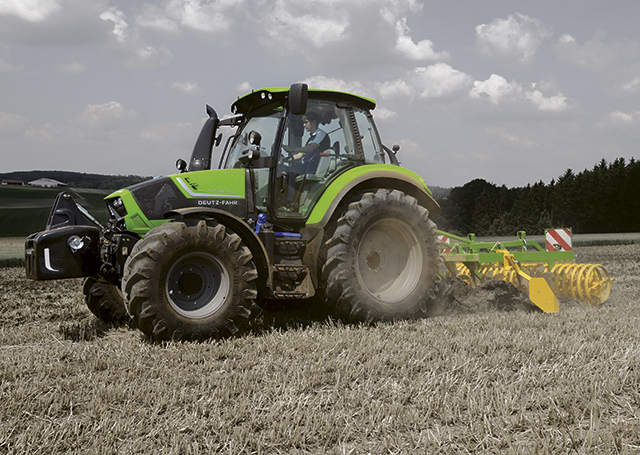 For more information on this attractive special offer please contact your local DEUTZ-FAHR dealer. 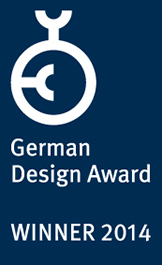 Our 6 Series TTV Agrotron and the MaxiVision Cab won the "German Design Award 2014" in the Category "Transportation and Public Space": this is an international premium prize that goes to top quality products and projects.